In today world of wedding cakes Brides and Grooms are looking for the cake to make a statement about them. Whether it being a simple or over the top cake. There are meanings behind the look, flavor, design, and accents. 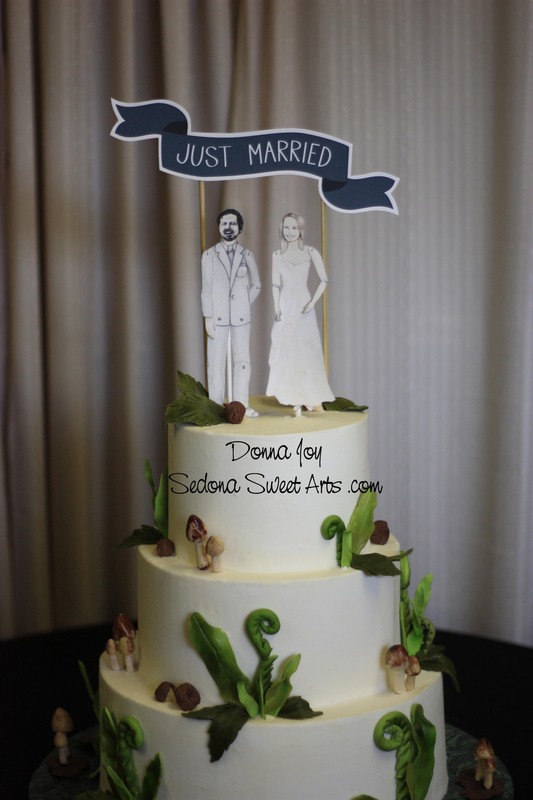 Sedona Sweet Arts is lucky to have a Cake Artist that is willing to go the extra mile to get that special touch. Every element of this cake was custom from the frosting, flavor, topper and accents. Originally Bride had an out of town friend that was going to do her cake. Then her friend had a family member get ill, so just a month away we took this cake on. Most of our large cakes get booked a minimum of 6 months ahead. Donna Joy jumped through some hoops to get things done. Pastry Chef / Cake Artist Donna Joy prefers to make all her sugar pieces herself. Since the ideas and themes are moving targets she generally does them free handed even though she will make or use a mold if possible. This cake the bride requested we use her favorite cake and frosting be used. Both recipes for the Ganache frosting and cake forwarded to Donna Joy. She tested both out ahead of time to make sure they were workable. A few minor adjustments were made to formulas. Then the formulas were scaled to meet the needs of wedding size. The party was a pretty good size party. The Wedding party opted to keep the cost within a certain price point, the main cake served a maximum of 83 and then a sheet cake with the same flavors was created for additional servings. While the flavors and frosting were a must for the Bride, she also had this adorable topper created by her Aunt from paper. The arms and legs moved. The image of Bride and Groom was a reproduction of the real Bride and Groom. It’s it sweet? Donna Joy had to make some adjustment to the cake to make it work. We just love it! The sugar adornments were all done free hand by Donna Joy. Acorns, plants, mushrooms, dirt, green fiddle heads. 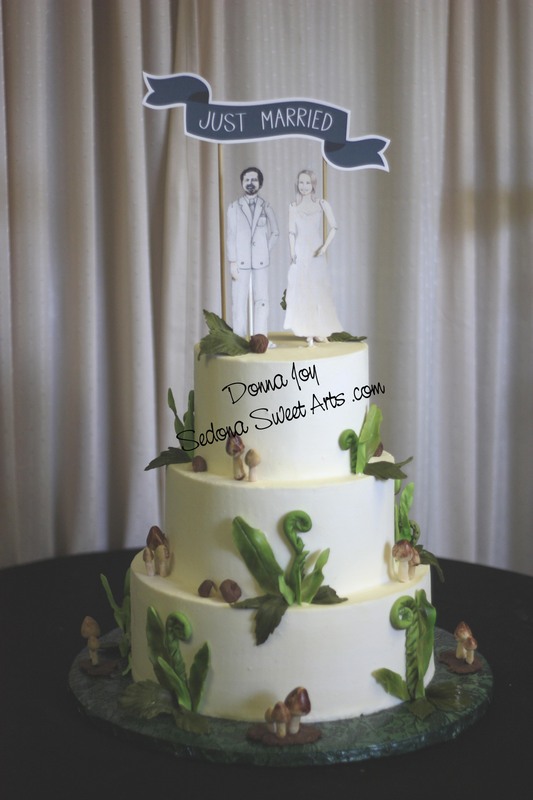 The mushrooms were created with food grade anchors so they could be placed on cake and then moved around with out moving or falling. Then she also made a moss cake riser to have the cake sit on and pull the theme together. We just loved everything about creating this cake especially the flexibility of Pastry Chef Donna Joy to work with someone else recipe, to creating the sugar pieces ,working with the Brides topper and do so all last minute. 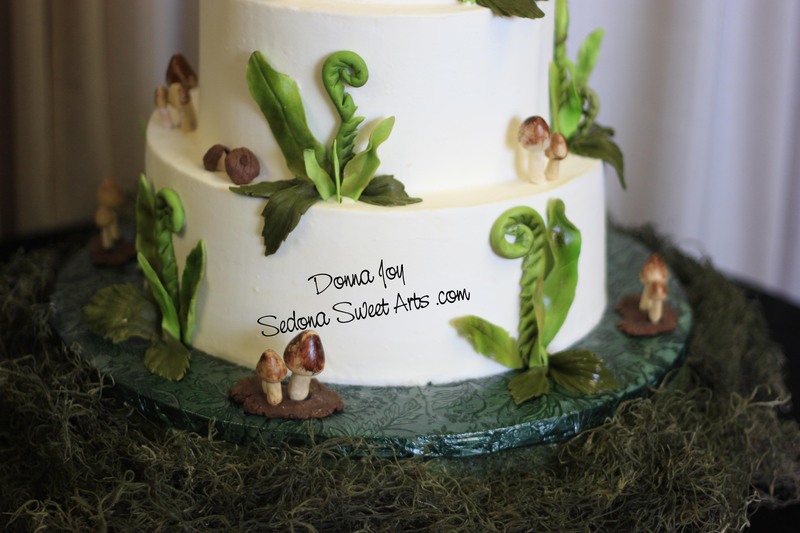 To see more of Sedona Sweet Arts creations please check out Sedona Wedding Cakes web site. To follow us on facebook please “like” our facebook page Sedona Sweet Arts.